Several members of the CAMBAM student community, and professors associated with it, are studying in the field of neuroscience, but CAMBAM only rarely sponsored neuroscience events. It is time for this to change! 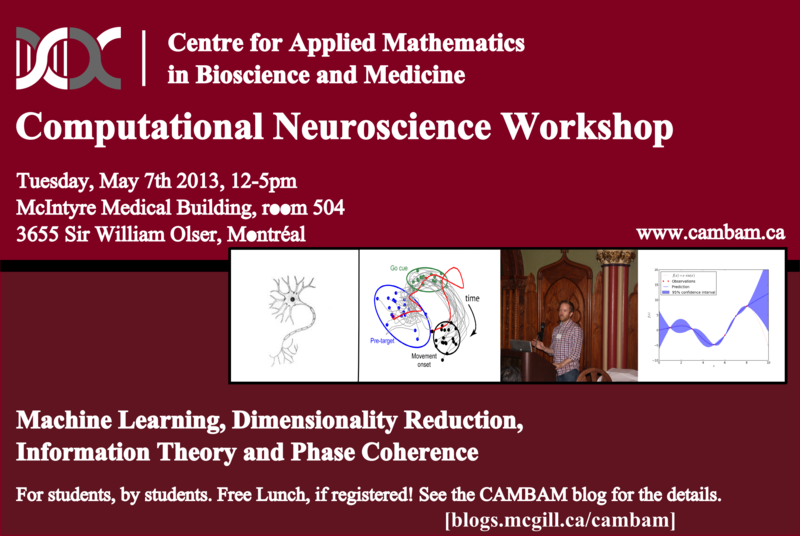 May 7th, 2013, in room 504 of the McIntyre Medical building, there will be a workshop on the theme of computational neuroscience. This workshop is for us, students, and us, students, only, a chance to learn, exchange, discuss and think about the mathematical tools available to our field, the usage of which is often grouped under the expression “Computational Neuroscience”. Talks have been setup by students of McGill and several labs are represented. For this edition, several tools, mainly applicable to electrophysiology, will be presented, but that shouldn’t prevent anybody from coming as there will be time allowed for open discussion. Free lunch. We invite you to register if you plan on attending, this will help us plan the meals accordingly (add your name in the doodle survey and select Yes, if you desire a vegetarian meal and No, if you want a non-vegetarian meal). Please do so by May 1st, as I will have to settle stuff with the traiteur. Introduction to regression and classification. Dimensionality Reduction: PCA and Gaussian Process Factor Analysis. Applications of Information Theory and Neural Coding. Phase Coherence as a measure of synchrony within and between brain areas. Published by Frédéric Simard on April 23, 2013 at 2:29 pm under Announcements, CAMBAM, Events, Student community.